Cashel Lodge offers Bed & Breakfast accommodation and a Camping and Caravan park, with superb views of the historic Rock of Cashel. Tom and Bríd O’Brien and their family welcome you to Cashel Lodge B&B offering superb accommodation and camping park in the heart of County Tipperary. We are located at the foot of the most famous and most visited historical site in Ireland, The Rock of Cashel. Nestling between the ROCK and the ancient Hoare Abbey Monastery to the West of Cashel Town. There is also an excellent caravan and camping site attached to the Lodge. 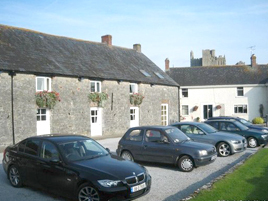 Whatever your preference, it is the perfect choice of accommodation for your visit to Cashel. Cashel Lodge is located on a working farm where sheep and cattle can be seen in the nearby fields. This charming stone building is over 200 years old and has been lovingly restored to the highest standard with every modern convenience at affordable prices. The new renovations and additions are in perfect harmony with the original fabric of the building. Cashel Lodge B&B Tipperary has been catering for guests for over 20 years and provides friendly service, quality B&B with en-suite rooms and locally sourced produce for breakfast. It also has WiFi and private car parking for guests and less than five minute walk from the town centre. Given its central location Cashel is an ideal location for touring in the south of Ireland. It is on the M8 Dublin-Cork motorway and is only one hour drive from Kilkenny, Waterford, Cork, Limerick, Shannon airport. Dublin is a little further at two hours drive but it is still close enough for a day trip. There are three great mountain ranges in Co. Tipperary that provide great walking experiences for so many people each year. These are the Galtees, Knockmealdowns and Commeragh mountains. There are ”walks to suit everyone” and maps available.